Impedance converter ADHL, high to low High frequency ADHL auto transducer with 2 RCA outputs and 4 wires. Polyropylene Capacitor 1.5uF, 250V, МКР, +/-5% Polypropylene capacitor, capacitance 1.5 µF, operating voltage 250 V and case dimensions 25 x 19 x 11 mm. Price 0.56лв. VAT Incl. 0.53лв. VAT Incl. 0.50лв. VAT Incl. 0.48лв. VAT Incl. Polypropylene Capacitor 2.2uF, 250V, МКT, +/-5% Polypropylene capacitor, capacitance 2.2 µF, operating voltage 250 V and case dimensions 35 x 16 x 9 mm. Price 0.63лв. VAT Incl. 0.60лв. VAT Incl. 0.57лв. VAT Incl. 0.53лв. VAT Incl. Polypropylene Capacitor 4.7µF, 250V, МКР, +/-5% Polypropylene capacitor, capacitance 4.7 uF, operating voltage 250 V and case dimensions 35 x 22 x 14 mm. Price 1.05лв. VAT Incl. 0.99лв. VAT Incl. 0.95лв. VAT Incl. 0.89лв. VAT Incl. Polypropylene Capacitor 6.8µF, 250V, МКР, +/-5% Polypropylene capacitor, capacitance 6.8 µF, operating voltage 250 V and case dimensions Ф19 x 46 mm. Price 1.33лв. VAT Incl. 1.27лв. VAT Incl. 1.20лв. VAT Incl. 1.13лв. VAT Incl. Polypropylene Capacitor 10uF, 250V, MKT, +/-5% Polypropylene capacitor, capacitance 10 µF, operating voltage 250 V and case dimensions ф23 x 46 mm. Polypropylene Capacitor 22uF, 250V, МКР, +/-5% Polypropylene capacitor, capacitance 22 µF, operating voltage 250 V and case dimensions ф32 x 45 mm. Price 3.15лв. VAT Incl. 2.99лв. VAT Incl. 2.84лв. VAT Incl. 2.67лв. VAT Incl. Capacitor Polypropylene 30uF, 250V, МКР, +/-5% Polypropylene capacitor, capacitance 30 µF, operating voltage 250 V, tolerance ±5 % and case dimensions ф33 x 55 mm. Price 4.13лв. VAT Incl. 3.92лв. VAT Incl. 3.71лв. VAT Incl. 3.50лв. VAT Incl. List Price 5.90лв. VAT Incl. 5.60лв. VAT Incl. 5.30лв. VAT Incl. 5.00лв. VAT Incl. Polypropylene Capacitor 47uF, 250V, МКР, +/-5% Polypropylene capacitor, capacitance 47 µF, operating voltage 250 V, tolerance ±5% and case dimensions ф42 x 55 mm. Price 6.30лв. VAT Incl. 5.92лв. VAT Incl. 5.67лв. VAT Incl. 5.36лв. VAT Incl. List Price 9.00лв. VAT Incl. 8.45лв. VAT Incl. 8.10лв. VAT Incl. 7.65лв. VAT Incl. Subwoofer crossover CAR-AX01, filter 80/125/250Hz Low-frequency sub-woofer filter. 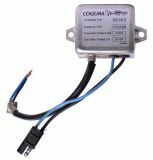 Filter, Cogema Cod.800.040.1, 24VDC, 2 x 10A, DC Cogema Cod.800.040.1 filter 2 x 10A protection against supply voltage distortions, power system harmonics, etc. Impedance converter, high to low, FH-107 Impedance converter, high to low. Impedance converter, high to low, FH-102 Impedance converter, high to low. Filter, two-lane, SH-621, 300W Two-lane audio filter, SH-621, 300W. Noise filter for car radio NF12/10, 10A Noise, audio filter for car radio, 10A for suppressing alternatotor noise.